Special Guest General Wesley Clark joins an all-star roster of wind luminaries for the Community Wind across America conference for the Midwest Region on November 15-16, 2010 in St. Paul, Minnesota. 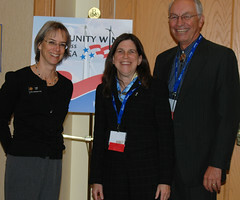 Attendees of the Community Wind Across America conference for the Rocky Mountain region in Denver, along with others, are invited to join the U.S. Department of Energy on Thursday October 28, 2010 to brainstorm and develop concepts for federal legislative involvement in the distributed wind landscape that you believe would accelerate distributed wind deployment. United States Department of Agriculture (USDA) Under Secretary for Rural Development Dallas Tonsager will deliver the keynote address at the Community Wind across America conference in the Rocky Mountain Region on the opening morning of October 26, 2010. Tonsager has more than 35 years of dedicated work as a farmer, businessman, and community, state and national leader. He has been a vocal advocate for USDA Rural Development's continued investment in renewable-energy options, which he sees as "absolutely critical" to our future and the "greatest opportunity for economic growth in rural America today." The story of Utah's first wind farm makes for a fascinating film documentary. It will be screened as part of the Community Wind Across America conferences in the Rocky Mountain region. Colorado Governor Bill Ritter, Jr.
Windustry is pleased to announce that special guests Colorado Governor Bill Ritter, Jr. and Commissioner of Agriculture John Stulp will speak at the Community Wind across America Rocky Mountain Region event, October 26–27, Denver, Colorado.